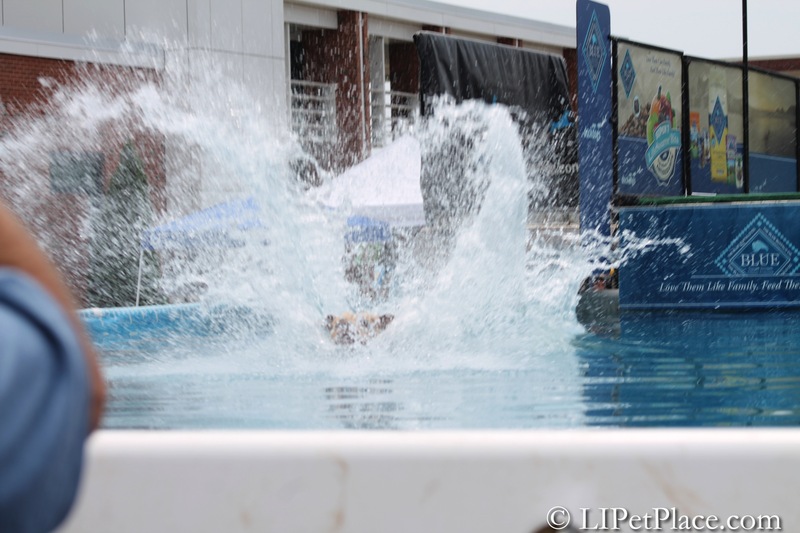 Dock Diving made a splash this weekend returning to Long Island for a 2nd time in the past few months with the most recent event that just took place in Westhampton Beach, N.Y. Friday and Saturday, July 29 & 30, 2016. 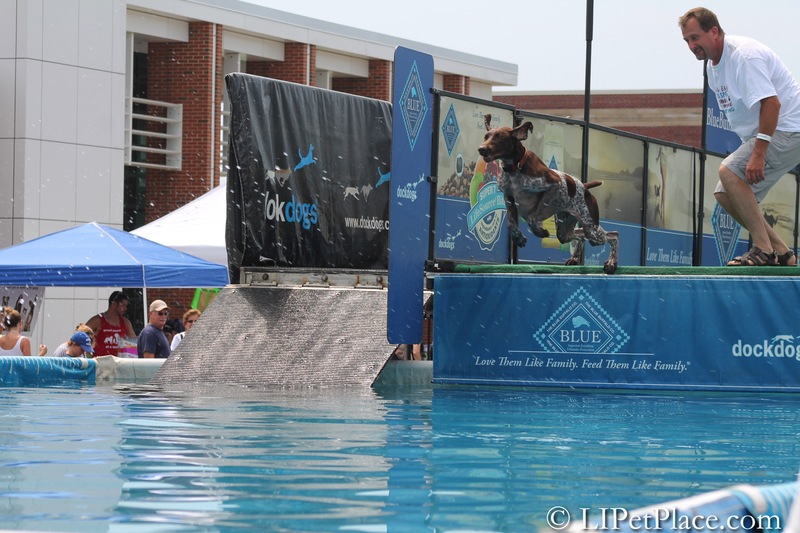 DockDogs, a Canine Aquatics Competitive company, was hosted by the Greater Westhampton Kiwanis & Hurricane Educational Foundation held at the Westhampton Beach High School. 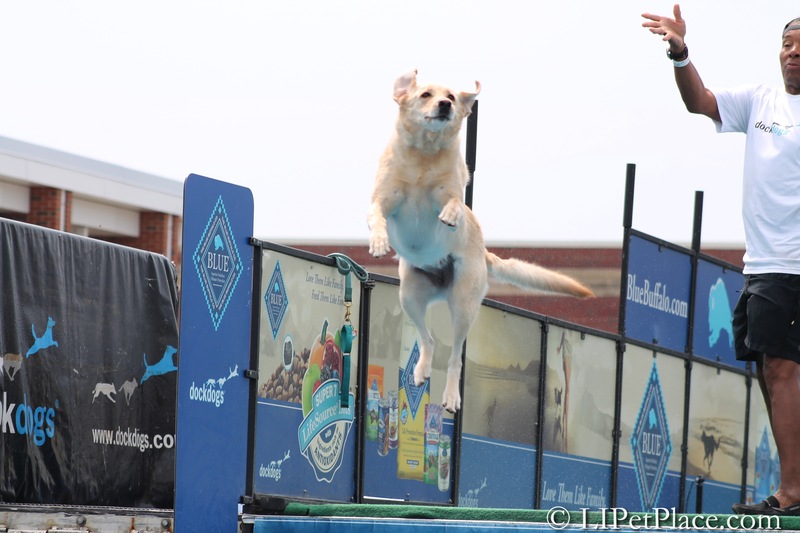 My dog Cody tried out and competed, but he is still a novice at it and didn’t do great – but we only are in it for fun – he loves, loves, loves to swim, but jumping off the dock can be a bit intimidating for newbie dogs. While he jumped in 5 times total in two days, he really only got to go up and try/compete a total of 8 runs. Awesome photo by Cathy Pratt Williams of Precious and Few Photography! 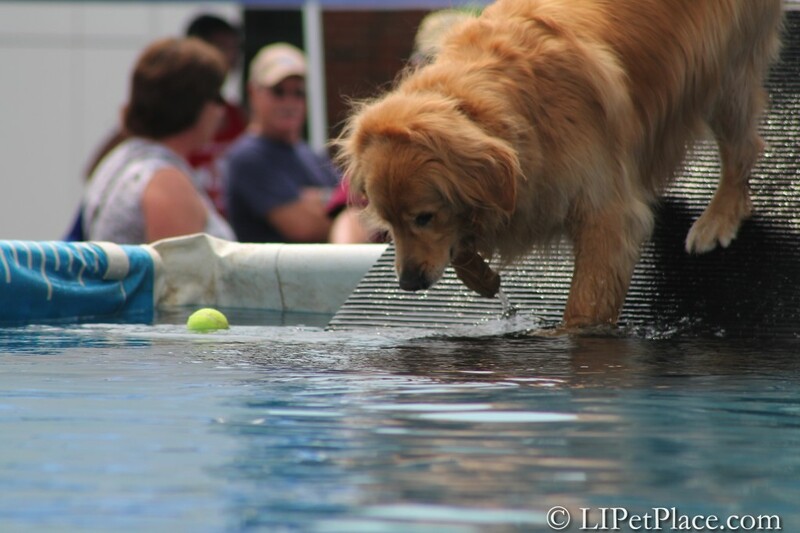 The first time he tried it was at the dog shows at the Oyster Bay Planting Fields in May – and he was able to try as many times as he wanted with the NADD AKC Diving Dogs. He jumped a few times then, so it was great to be able to try again with him this weekend. 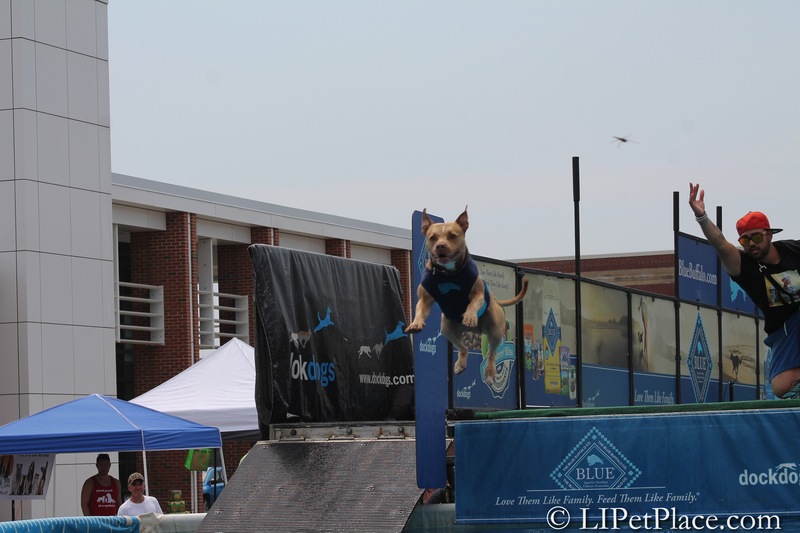 Many of the dogs at today’s event were pros and just so much fun to watch them fly through the air, like this dog, Tango the Pit Bull – what a sweetie! And he competes a lot. 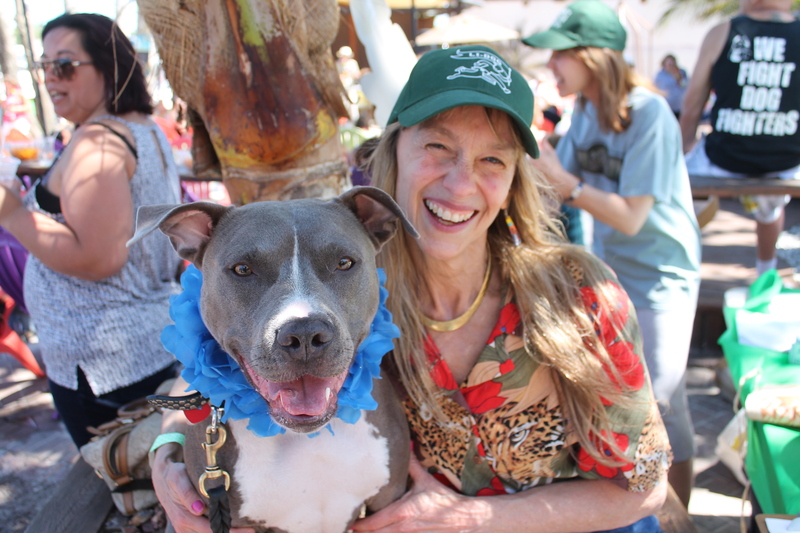 Pet vendors and people from all over brought their dogs to try it or compete. There were dogs there from Arizona and Connecticut, Queens and of course LI. If you missed it and you are thinking of trying out with your dog, first remember it is for fun – and if your dog actually is good at it then competing may be for you. 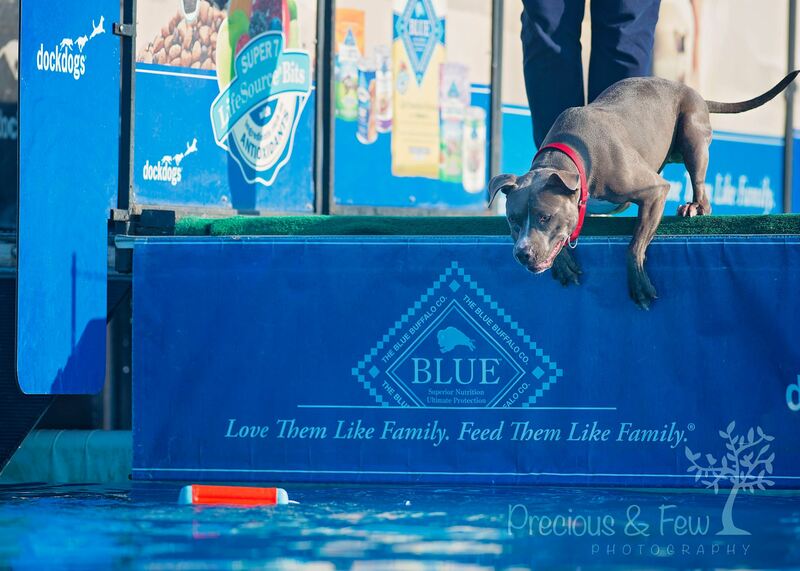 Your dog needs to have a strong toy drive, be able to swim well – and loving to swim really helps. You have to give your dog time, some dogs take right to it where others, like my own dog, don’t always jump, no matter how much they love their toys or the water. And that’s ok, he had fun is what counts. 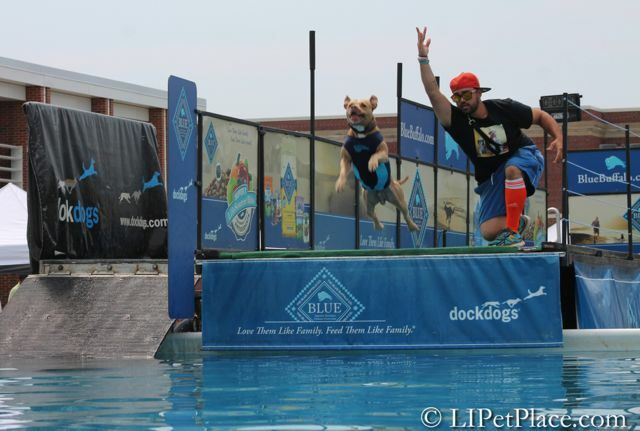 One of the local DockDogs instructors is hoping to start Long Island Dock Jumpers, email LIDockJumpers@gmail.com for more information. Thanks to Terrie Bauer and everyone who helped put this event together – we know how much work it takes to put on any event! For MORE pictures of the event, click here! I also really enjoyed the music and MC for the event – he did a great job the entire time. 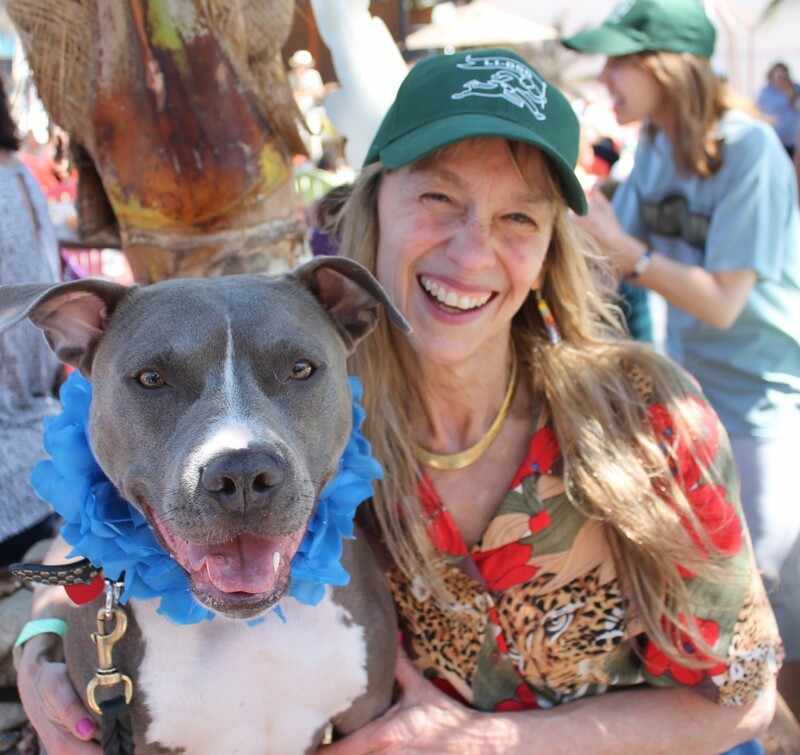 If you missed this event and want to be sure to never miss another pet event happening here on our isle and beyone, click here to sign for the free weekly Pet Events Newsletter! While we are enjoying the warm weather and summer activities – our pets may not be. One thing many people tend to forget or not even think of is pet safety and heat. While there are many ways your pet can overheat; too much exercise in the heat of the day; squished face pets like bulldogs, pugs, Frenchies, Shihtzus who can’t breath that great to begin with – they have a hard time with the heat; and lack of access to water for your pets especially if they are outside for any length of time in this hot and humid weather. Of course this time of year the major concern is pets left in cars. 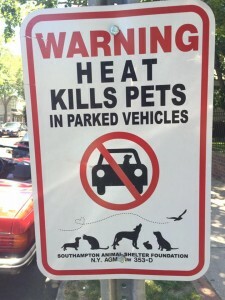 It amazes me year after year, that I still see people on a warm day leaving the windows open a crack and leaving their very furry dogs in the car – while they go into a store. According to a study done by San Francisco University, and if you haven’t seen this video of a veterinarian sitting in a hot car which shows how quickly temps rise during a heat wave. Why not try it yourself, without your pet of course. Next time it is a beautiful 75 -80 degrees, go sit in your parked car crack the windows a bit and sit in there for 10 -15 minutes. Don’t cheat by drinking water or turning the AC on. Now imagine yourself in a fur coat without the ability to sweat. Are you hot yet? Sometimes people think it’s ok to run into the store for 5-minutes during the summer and leave their pets in the car. But what if you get stuck in the store, there is a long line, problem at the register, etc., and there you are in the air-conditioned store while your pet is sweltering in the heat, causing heat exhaustion or worse death. Call Animal Control of the town the car is located in. *Helpful tip, program the Animal Control phone #’s of all your town municipal animal shelters into your phone so you can quickly access them. Call the police, tell them the location, make/model color of the car, give them the license plate number. Take a photo of the car, license plate and pet inside the car. Stay until the authorites arrive to be sure the pet was safely evacuated from the hot car. Know the laws in your town, city and state. Some people may take actions into their own hands if the animal is in severe distress in the hot car and may get in trouble for bashing in the window of a car to save the pet. Some areas the laws are changing where you would not get into trouble. Check to see if the car is running, sometimes people leave their car locked and running with the AC on, water in a bowl to run into a store for 5 minutes. It may not be ideal, but they are making the effort to make sure their pet is cool while they do their errand. This also goes for people who are traveling alone with their pets on a road trip, and may have to stop to use the rest stop. Pet owners should also know if you are caught doing this or someone reports your car with a pet in it to the police, the police have the right to break into to your car with whatever means necessary, call animal control and have your pet seized. You may be issued a summons, arrested for animal cruelty, or more. So the next time you are running up to the supermarket on a hot day, please, please, please leave your pets at home in the AC! Make sure you have a collar with ID tags on your pets at all times during this weekend. Some owners like to take their pet’s flat collar off when they are in the house – but the first block buster that goes off could scare your pet so much they may bolt out your front door and take off. Even the most well adjusted dog or cat could get scared easily. Also be sure to have your pet’s microchip registered with your contact information. If you know your pet is terrified of loud noises, try using products like Rescue Remedy® or Canine Calm™ or in extreme cases contact your veterinarian for tranquilizer/valium pills ahead of time. Leave your pets home in a secured house. Pets do not need to be at firework shows, it’s almost inhumane if you are not sure of how your dog may react. Know your dog, some dogs don’t seem to mind, but think about their sensitive hearing. And what if a firework goes rogue and comes close to your dog? Anything can happen so it’s better to be safe than sorry. Crating pets that are used to being crated will add a layer of protection as well, keeping them confined and in a safe place they are used to. Parades and pets. Some pets may be fine with attending a parade with you, however the majority will not be used to the loud noises, crowds and tell tail signs that dog is stressed: are licking their lips, shaking, panting excessively, crying, pulling on the leash, and acting out (i.e. not their usuall behavior). Again, know your pet, and don’t be in denial about what they can and can’t handle. Some pets do not do well in large crowds, people, kids petting poking at them, loud sirens from fire trucks going by, etc. If you see your dog is stressed – leave the parade – don’t comfort the dog with, “It’s ok” while petting the panicked animal – that will just make it worse. Bringing your dog out on your boat or too the beach? Bring plenty of cold bottled water, pet safe bug spray and sunscreen, extra leash and collar with ID, treats, a properly fitted doggie life jacket, and monitor them for overheating, bug bites, ticks and make sure their paws are not on hot surfaces for a long time – concrete and sand can be scorching- and of course bring poop pick up bags! 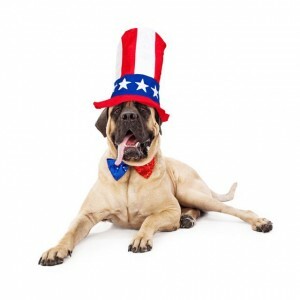 Traveling for the 4th and bringing your pet? Find out where the nearest 24-hour emergency clinic is at your destination. Make sure there are no Breed Restrictions at your location. While en route use a safety harness that clips into the seatbelt of your car, or crate your pet while traveling. Have a first aid kit in your car especially for pets and bring extra pet food and water – you never know if your car breaks down you get stuck somewhere. Always have an up-to-date picture of your pet with you, i.e. on your phone in case your pet gets lost during the 4th. Store local animal shelter contact #’s in your phone in case you need to call immediately. Having fun and enjoying the 4th of July is part of our human lives here in the US, but just remember it may not be normal for our pets who don’t understand loud noises, blasting, whistling fireworks and bright sudden flashes of light. Have a happy and safe 4th! Living on a Island we are crazy fortunate to be able to enjoy many beautiful areas of beaches with our four-legged friends. It used to be, just bringing your dog to the beach was just that bringing your pup with you. Now-a-days we are much more conscious about dogs and their needs while enjoying a day at the beach. 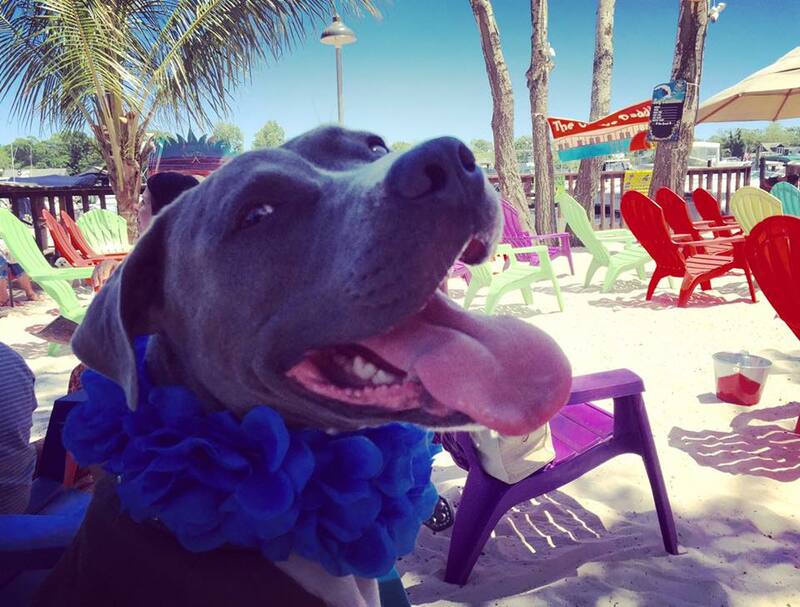 You may want to take your dog with you earlier in the day or later in the afternoon, one it’s not as hot or at those times and some beaches have specific beach hours when dogs are allowed. 1. 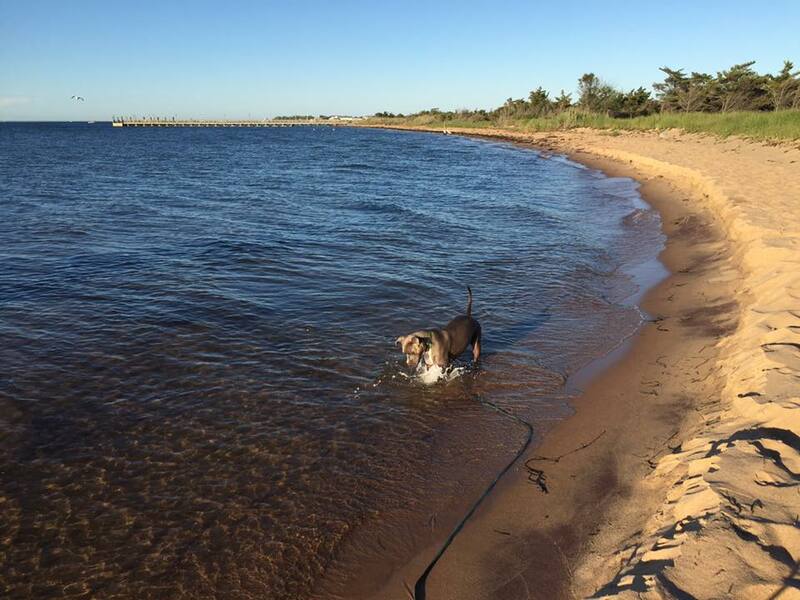 Fresh cool water – This is pretty obvious, but you would be surprised how many people don’t think to bring fresh water for their dog while out at the beach. I have water with me, and a couple extra bottles in a mini cooler in my car so when we get back there I can give my dog a drink. Dogs get extremely thirsty while having fun in the sun, swimming and romping around, and get dehydrated if you don’t give them fresh water. Bring a Portable drinking bowl – there are many collapsible dog bowls in many different sizes, as well as bottles that sport their own drinking tray. Bring something with you that your pet will be encouraged to drink from vs. salt water in the ocean. Be sure to keep your dog hydrated, if they ingest too much salt water it can give your dog the runs or worse. 2. Long leash – Not a retractable leash, but a cotton long lead or leash where you can get at most pet supply stores. They come in different lengths up to 50 feet. 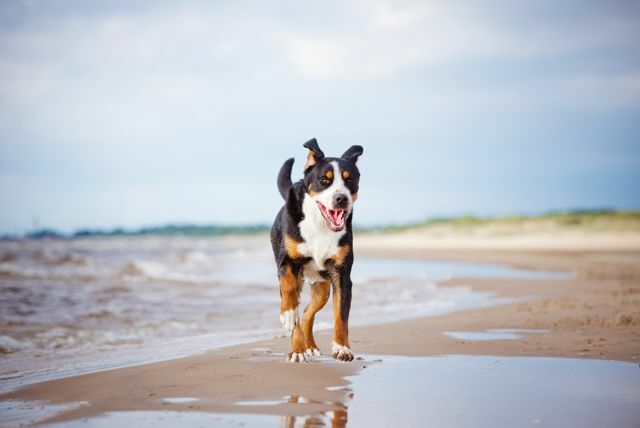 Your dog may swim perfectly, but anything can happen at the beach – he could decide to swim out farther, perhaps not hear you call, get caught in a rip current, etc. In my experience is is not worth it for your dog to be loose in the water. A long lead is a life line literally to your dog. 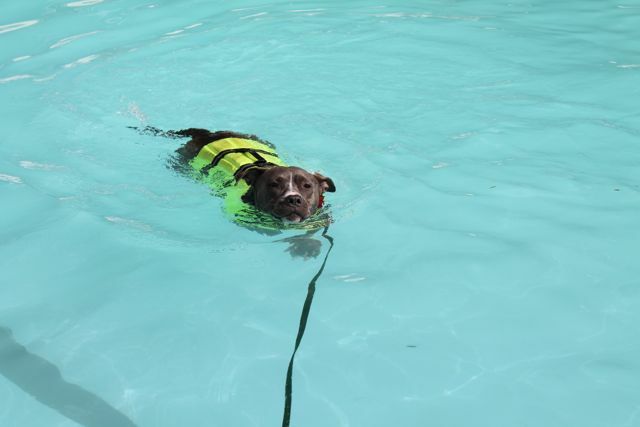 3.Lifejacket – some dogs need a boost swimming, take for instance my dog Cody, great swimmer but is also not built for swimming in that he is very muscular – and muscle sinks. So if he were going to be in deeper water – he would 100% have a life jacket on to help him be more buoyant and for him to be safe while enjoying his swimtime. (He has even wore a lifejacket while swimming in a pool.) 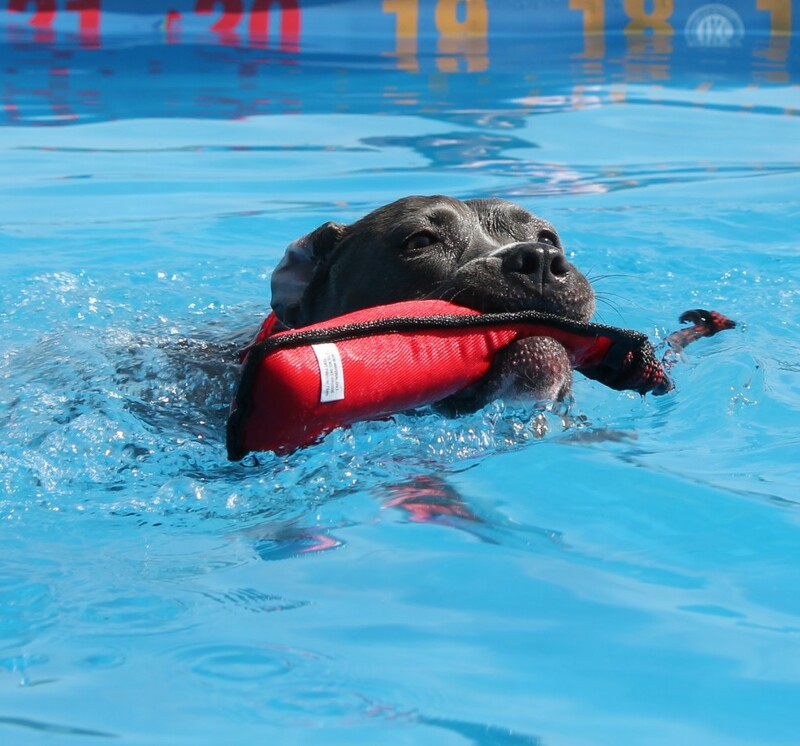 Make sure you get your dog fitted properly when buying a life jacket. 5. Limit the swim time – For my dog Cody I limit his swimming time to no more than 20 minutes. Due to his breed, his mouth is wider than say a lab or golden and if he is carrying a stick or floating toy while he is swimming more water will go down that wide mouth than with other breeds. My old dog Max would ingest a lot of water while swimming – so no more than 20 minutes and he was fine. >> Another good reason to limit the swim time, is that dogs can get tired quickly in the water – and may not show it. That’s where we as pet parents need to step in and make them come out of the water to take a break and rest. 6. Pet Friendly Sunscreen – you can find this in many pet stores, health food stores and even online. Apply to the top of your dogs nose, on their snout, not the actual nose, and ears – dogs can get sunburn as well. If your dog is white or light haired in color and has short hair I would apply it on his back as well. 7. Pet Friendly bug spray – again, you can find many brands of natural pet friendly bug spray that do work and are free from harsh chemicals. The only time I use stronger bug spray is during a heavy mosquito season or when there are a lot of green flies. 8. Blanket – this may seem like what? 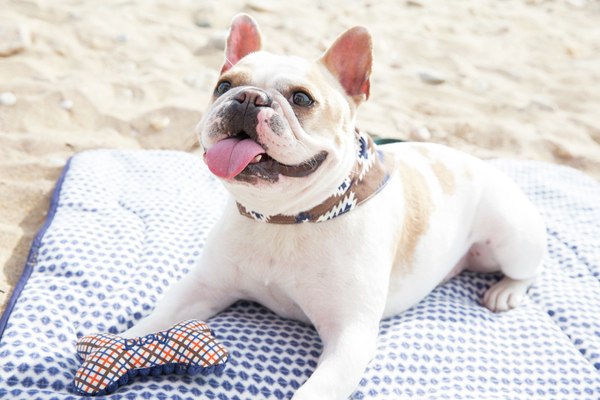 My dog is going to get sand all over it – the sand may be hot after a while and you will want to have somewhere to have your pet rest – a great option is the Territory travel blanket which is a bag and blanket in one. You can carry some of your pets items in it, and then unroll it at the beach. 9. Umbrella – this is really only necessary if you are spending the entire day at the beach – it’s important for your dog to have shade to lay under and not be in direct sun all day. Same goes for you! 10. Extra waterproof collar – with ID! – My dog likes to go in the water so he wears a waterproof collar while in the water so not to ruin his regular collar. And an Extra regular leash – sand can easily get into the clasp of your leash and jam it making it not effective, you can knock the sand out but if your leash is exposed to the elements often, rust, salt water and sand do NOT make for a secure leash. Bring an extra leash with you for an added safety measure. Also you should Monitor your dog always while in the water – I prefer to keep my dog on a long line so he can’t get too far into the water and I can pull him back to me if I see him trying to eat something in the water or on the sand. Yes, he knows leave it and drop it, but you know how quickly a dog can eat something he is not supposed to. And Watch for wildlife – in many areas there may be wildlife your dog is not used to seeing, like deer, turtles, sea birds, crabs and so forth and if your dog is not leashed, it will not be a good thing if he takes off after a deer or tries to pick up a live crab! So keep your eyes out, and in the water too. If there are lot of crabs or jelly fish – don’t let your dog in the water, getting pinched by a crab or stung by a jelly fish is no more fun for our pups than it is for us! You will also want to watch your dog and not let him eat anything on the beach. Haha, I know good luck -but there are many scrumptious dead things on the beach often, shells, seaweed, broken glass and sadly on LI, garbage – so train your dog the ‘leave it’ and ‘drop it’ commands! These commands will come in very handy as your puppy is running with a dead crab in his mouth. Yuck! Lastly, it is good to rinse your dog off from the salt water when you get back home and thoroughly check your dog for ticks, and check again! Also look for any scraps or minor cuts, especially on the paw pads, that need attention. Paw prints in the sand and great days on the beach with our dogs are a big part of island living – get out there and enjoy it with your dog! 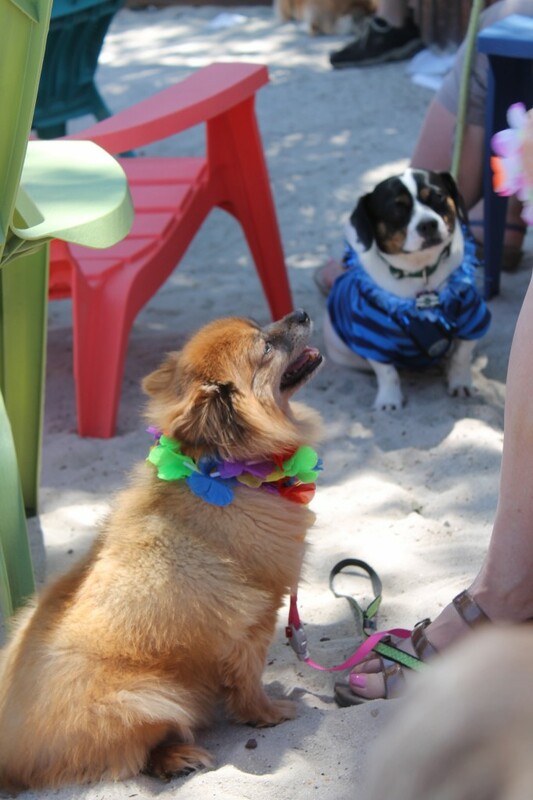 On Sunday, June 12, LI-Dog Owners Group hosted a Pints & Paws Luau BBQ at Off Key Tikki on the water in Patchogue, NY. 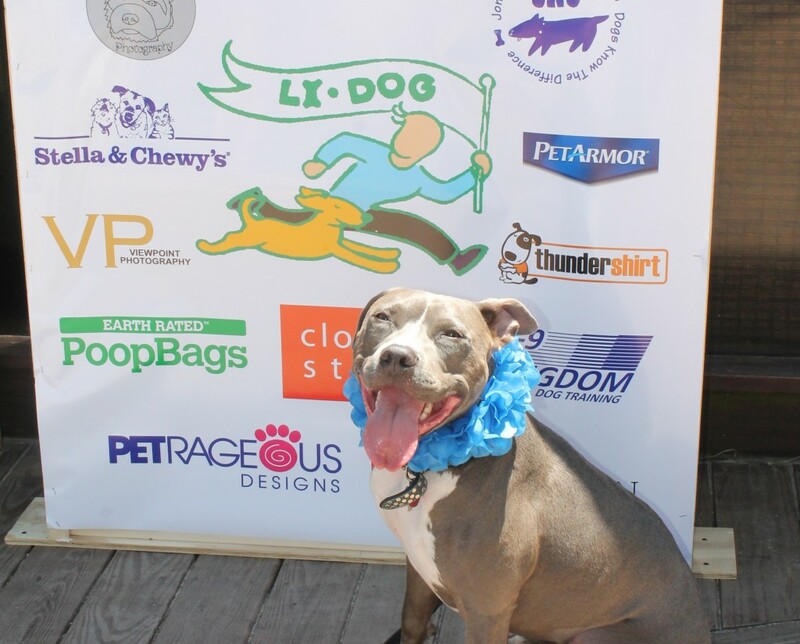 LI Dog is a is a non-profit organization that works to create dog parks and increase access to public parkland and beaches for Long Island dog owners and their dogs so they can enjoy Long Island’s beautiful parks and beaches just like other Long Island families. 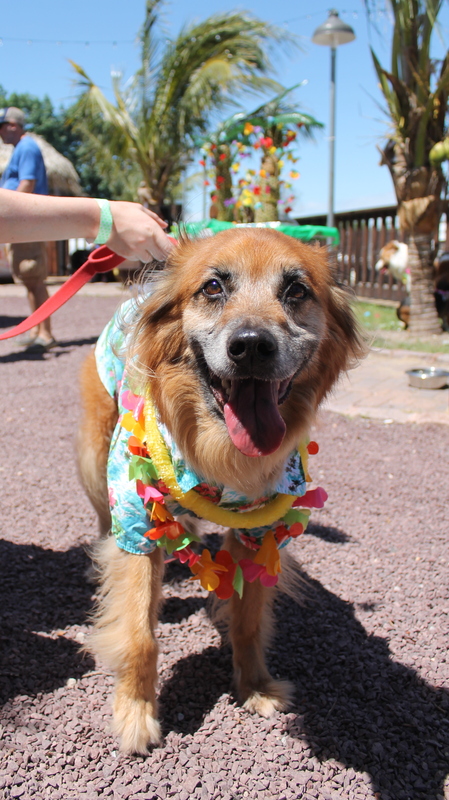 It is so much fun to be able to go more and more places with our dogs here on Long Island and much of that is due to LI Dog’s years of effort. From opening more dog friendly beaches, to dog runs, making Nassau County, (nortiously one of the most unfriendly counties in the country to own a dog), becoming more dog friendly by opening up on-leash dog trails within parks in Nassau. LI Dog has worked tirelessly over the years and their effort continues to pay off for dog owners on Long Island – especially now that dogs are more widely accepted as big parts of our families. Cody enjoying himself at Off Key Tikki! 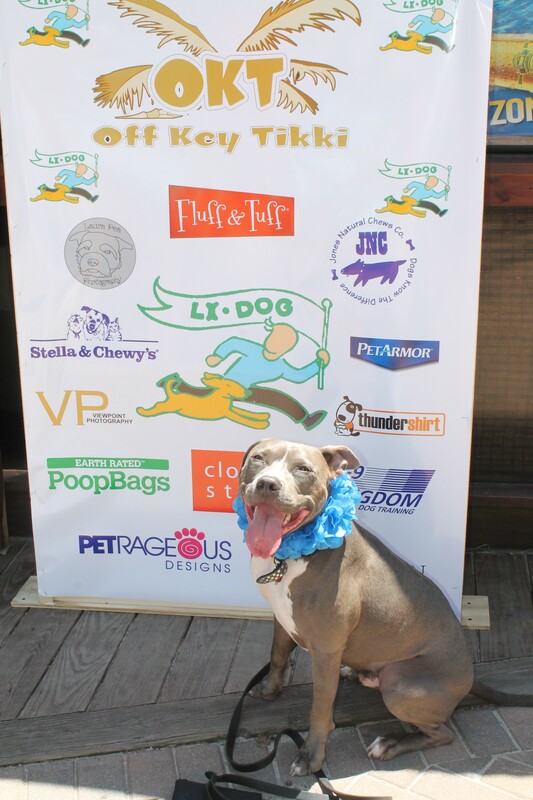 This event at Off Key Tikki was a fundraiser for LI Dog where you can come and enjoy the venue with your dog and friends, there were games like ‘Biggest Lap Dog’ (my dog pretty much came in 2nd place! ), musical chairs for humans and their dogs, and a few others. There were also door prizes, raffles and of course the step and repeat. 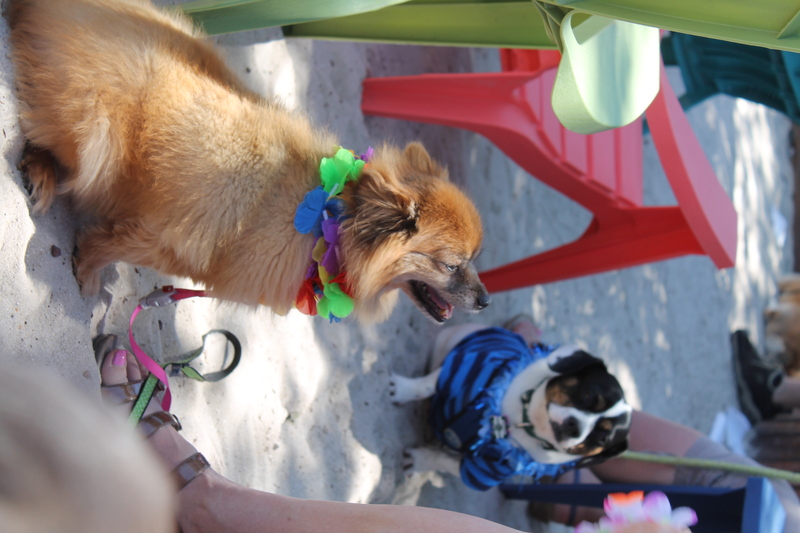 The staff at Off Key Tikki could not have been nicer and you could tell they loved having the dogs there. Dogs dressed in their Luau gear of course! LI Dog has many activities and events throughout the year that you can participate in, Pack Walks in various locations across our isle; beach days at dog friendly beaches; pints and paws where you can bring your dog with you to a local outdoor area of a bar or restaurant (like this one on Sunday); and regular meetings on how you can get involved in helping them continue the good work they do and make LI even more dog friendly. Mocca! A regular at all dog events on LI! On a total side note, you have to love all the palm trees at this venue – like we were swept away to a tropical paradise! Cody and LI-Dog's Ginny Munger Kahn! For more information on LI-Dog go to their website www.lidog.org and if you want to see many more Pictures – CLICK HERE!